Haidegger, Géza and Kovács, György and Ruotsalainen, Werner and Stokic, D. and Lichodziejevski, C. and Urosevic, L. and Smater, M. and Puchalski, S. and Gramma, C. and Sorli, M. and Armijo, A. and Grosse-Hovest, G. (2009) Operations management of dismantling and re-use of ELV-s by novel multi-agent system, processing added value and estimation of detailed costs. 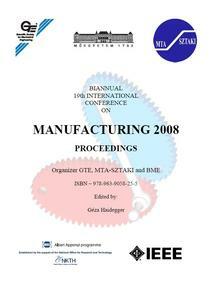 In: Manufacturing 2008. Biannual 19th international conference. Proceedings. Budapest, 2008..